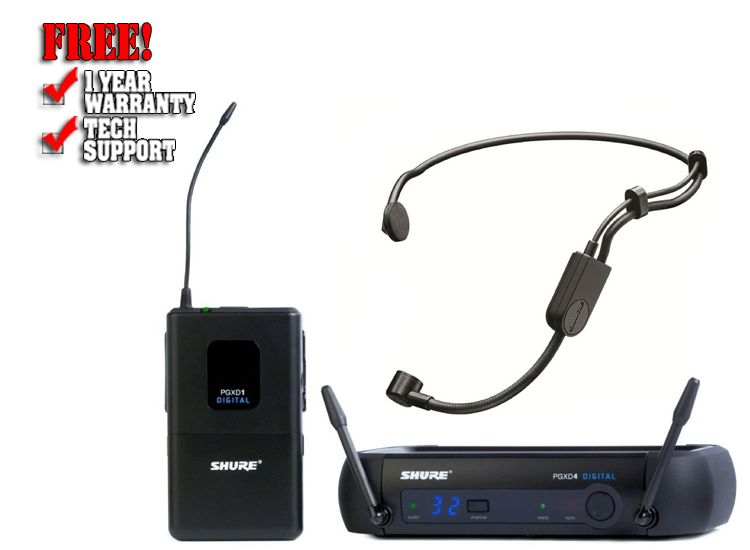 The Shure PGXD14/PGA31 Digital Wireless Headset Microphone System is part of the Headworn wireless systems family. PGX Digital Wireless, with state-of-the-art, 24-bit digital audio and trusted Shure microphones, delivers stunning sound and a strong, clean RF signal. The precision of 24-bit digital audio comes to the renowned Shure PGX Digital Wireless System. Combining rugged, trusted Shure microphones with state of the art digital wireless technology, PGX Digital delivers stunning sound and a strong, clean RF signal. Add in easy setup and operation, and the result is wireless audio that completely redefines clarity, simplicity and performance. The PGA31 performance headset microphone for general, speaking and performance use is a permanently-biased electret condenser microphone. Engineered to provide maximum versatility and reliable performance in a wide array of conditions at an affordable price, the PGA31 is compatible with any Shure wireless bodypack systems with TA4F (TQG) connectors. The wearable design offers improved comfort and a secure fit for hands-free operation in any situation, while the unidirectional (cardioid) pickup pattern provides excellent off-axis rejection for higher gain-before-feedback when using a stage monitor. Includes: PGXD4 receiver, PGXD1 bodypack transmitter, PGA31 headset microphone, 2 AA batteries, power supply, clothing clip, windscreens, carrying case, and user guide.